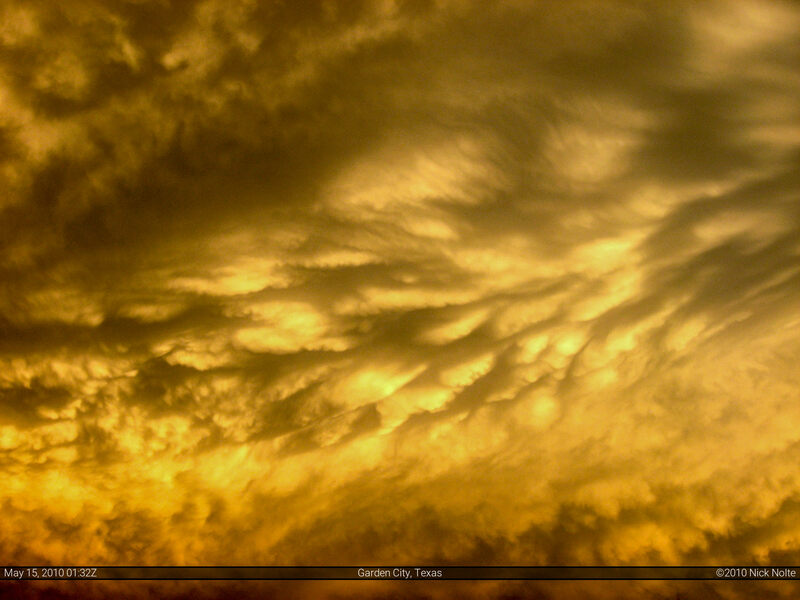 At about 10am CST, I headed out of Midland and jumped on I-20 and decided I would go setup in Monahans, TX. When I got to Monohans I could see a tower already going up to the west near Mentone. As I continued west on I-20 to see if that storm would do anything, I could see cells behind me begin to go up as well as I passed Barstow and approached Pecos. It was clear, at this time, that I probably didn’t need to leave Midland in the first place. 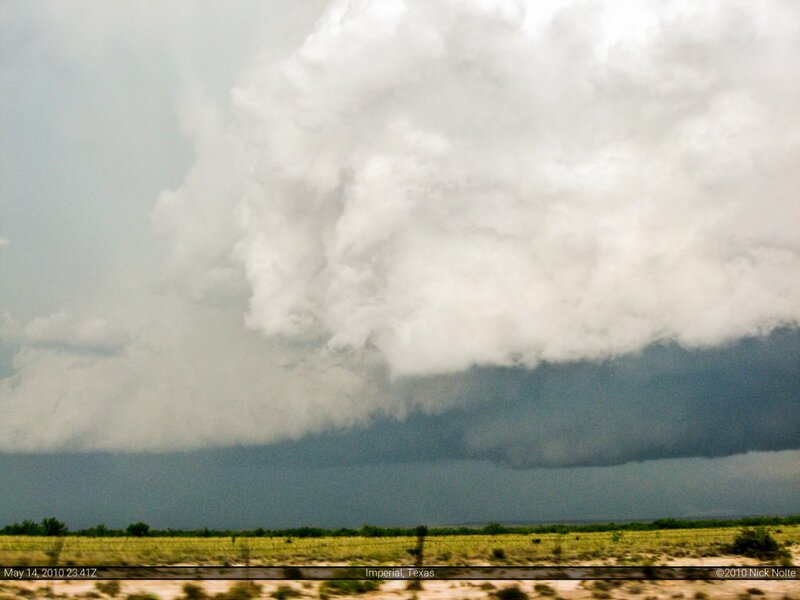 I shot up US 285 in Pecos to try and catch back up to the storm I had seen forming near Mentone. 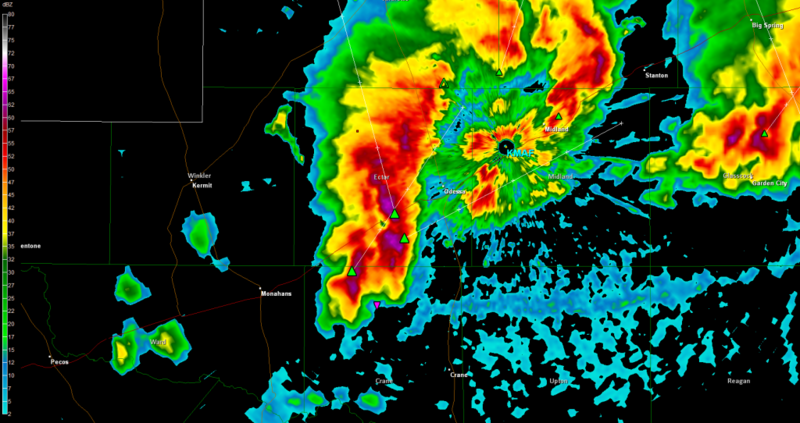 By the time I got up to that storms were really getting going back east towards Kermit, just west of Odessa. As I entered Kermit around 12:30pm the storm just east of there had really gotten it’s act together. 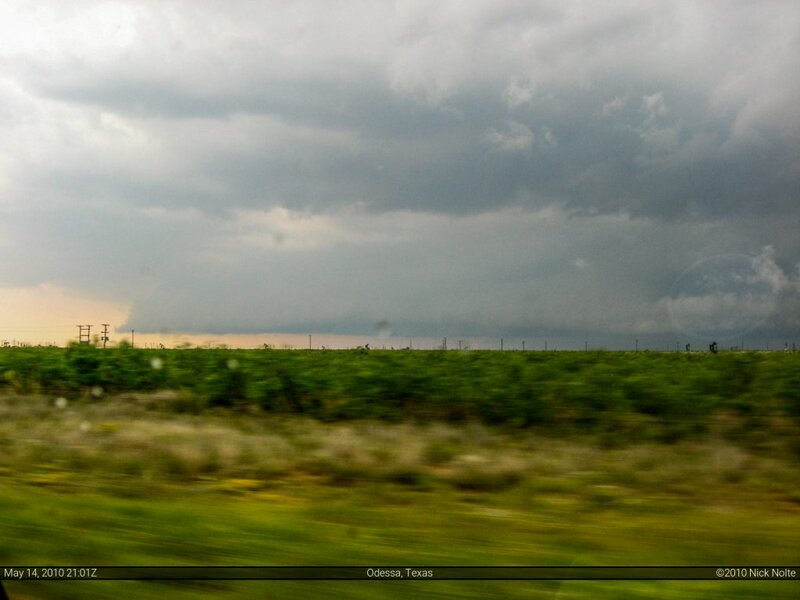 I decided to try and get in front of the storm so I continued east towards Odessa. 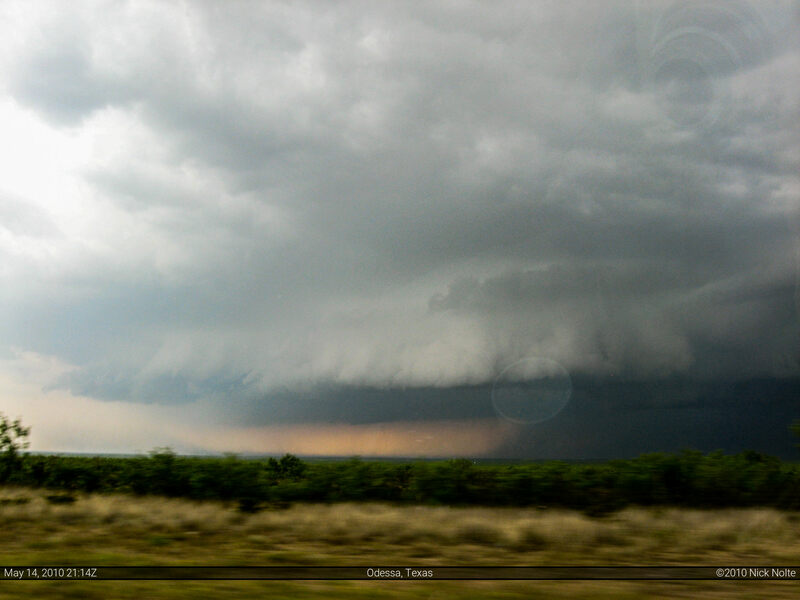 It was at this time that the National Weather Service in Odessa issued a tornado warning for the cell I was tracking. I had gotten out ahead of it, and looking back didn’t see any signs of a tornado, although wall cloud lowerings were quite obvious. As I approached West Odessa, being in front of the storm, now was a good time to move south and reposition for an approach. I turned off of TX-302 and went back west along 42nd street in West Odessa to FM 866 which runs north to Goldsmith. 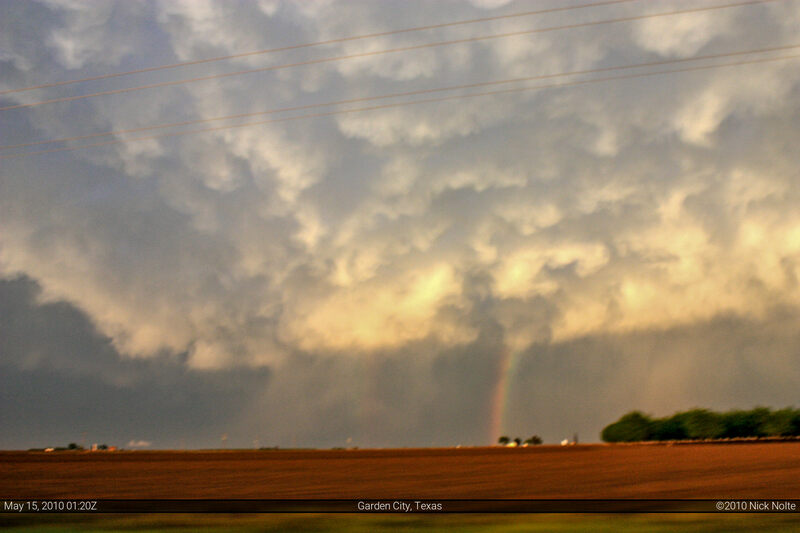 This is the time I encountered the golf ball sized hail and received some new dents, courtesy Mother Nature in my car! I pulled off the side of the road at 1:35 to watch the clouds and there was some pretty wicked rotation going on in front of me, but no funnels. As I continued on towards Goldsmith, the rain was continuing to get heavier and it had started to hail yet again. Once I arrived in Goldsmith, visibility was pretty low so I turned around to drop back down south. 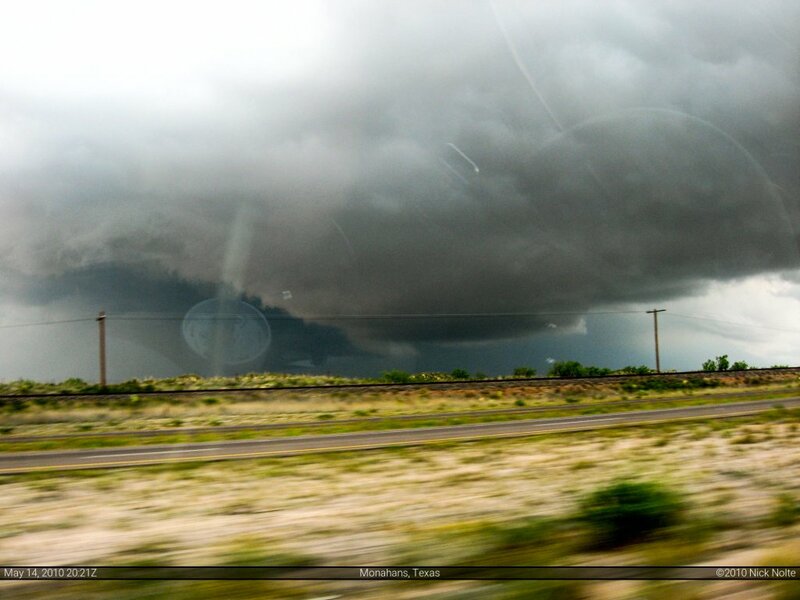 It was at this time that a Tornado Warning was issued for Midland (if only I had stayed at the hotel, lol). I headed back to TX-302 and decided to go west one more time as another cell was crossing the highway about 4 miles southwest of Goldsmith. Hail yet again! I decided my car didn’t need anymore dimples, and turned around and headed towards Odessa and Midland. As I arrived in West Odessa at 2:15pm and turned south on FM 1936 to hit I-20, I was distracted yet again by another cell crossing TX-302, so I turned around one more time to check it out. I didn’t see anything exciting this time, stopped to get gas, inspected my new battle scars on my roof, then headed for I-20…Seriously! At 2:36 I finally got back on I-20. 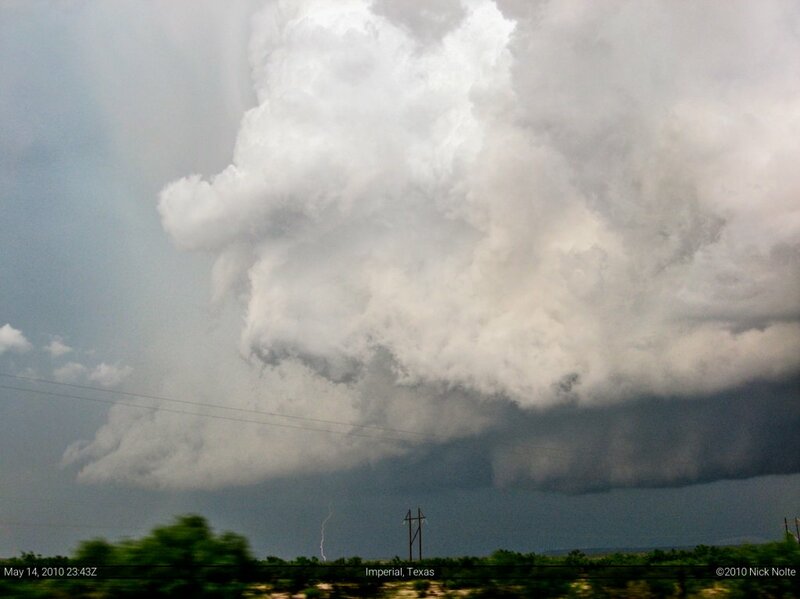 I headed west to check out a cell near Monahans (as you can tell I did a lot of back n forth this day). I went a little north of Monahans on TX-18, but decided that the action was starting to move east so I turned back to I-20. Just before I got back into Odessa at about 3:45, the Interstate began to backup. Apparently while I was west dinking around Monahans the Interstate had flash flooded here for a bit. There were signs indicating the road was closed, but when I drove through it was clear. On a related note, the following morning as I was heading out of town, there were numerous areas along the frontage roads that were still flooded with 6 to 12 inches of water. I also spotted an abandoned car that had been washed away into a storm drain. At about 4:00pm the storms west of Odessa were beginning to line out, so I decided to go play tail end Charlie and check out the cells firing further south down US 385. 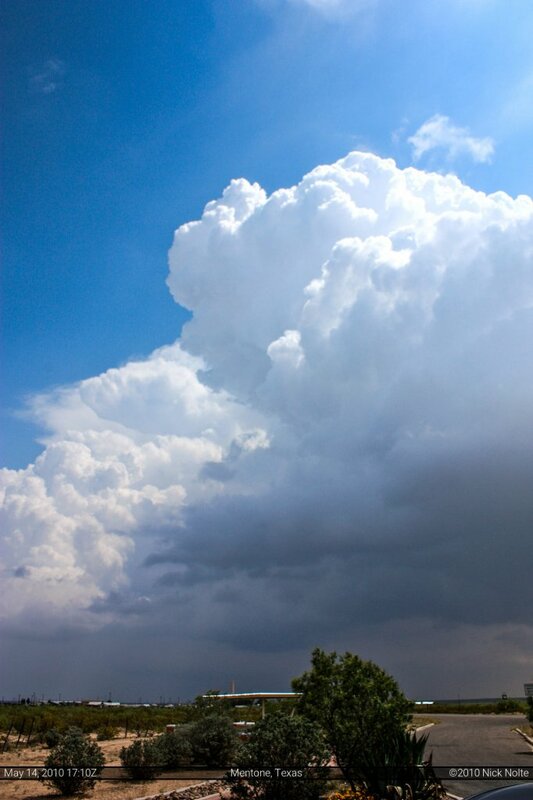 I arrived in Crane around 4:30 and hung around while the storms backbuilt to the south and west. 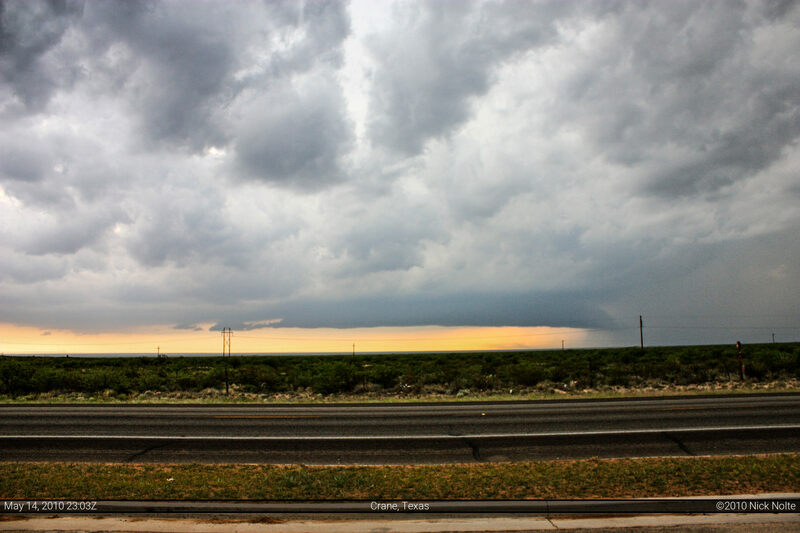 The storms were dropping quite a bit of rain, but I lost interest in the ones near Crane and decided to head further south on US 385 to McCamey and try to intercept the southern most storm, which at this point was about 15 miles southwest of Crane and heading to the ESE. 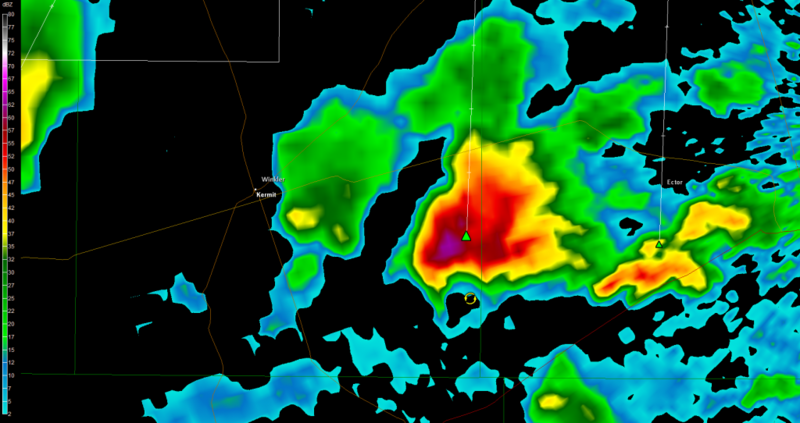 After arriving in McCamey around 6:20 I drove west to US 67 to try and get on FM 11 and intercept the storm. 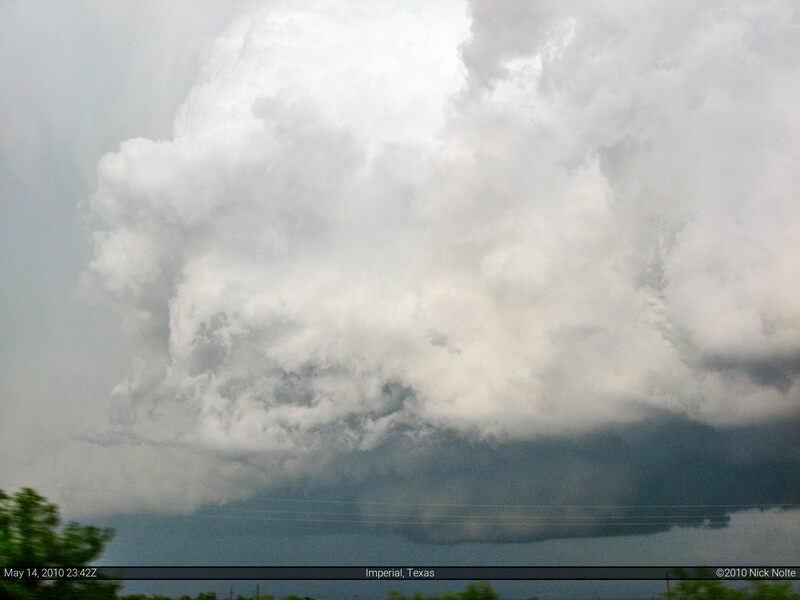 I managed to get there in time and see some awesome storm structure including the rear flank downdraft.